These beautifully marked and colourful finches have been increasingly reported in gardens in Arran this year. Some people have stated that they have had them in the garden for the first time ever. Watch a Goldfinch feeding and you will see how agile the bird is. With its long narrow beak it can access seeds that other finches cannot reach, including those of teasels. 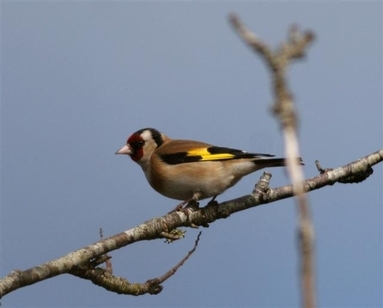 Goldfinches can be quite aggressive towards other species when at bird feeders. If you do get them on your garden feeders, look at the extent of the red on the face and this will help you identify the gender of the bird in most cases. The red in males extents in a bulge, back, above, and beyond the eye. In females, it is the white that bulges forward into the red, so that the red does not extend back beyond the eye. Young birds can confuse, because although they have the black and gold wings of the adults, they do not have the red and white face, instead they have a finely streaked grey white head.